Want to haul multiple cars but you're worried about trailer length? 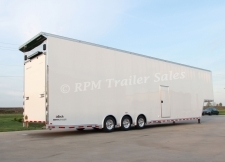 At RPM Trailer Sales, custom stacker trailers are designed to meet the needs of touring professional racers, as well as those of the sportsman ranks and serious recreational enthusiasts from motorcycles to stock cars. Our Stacker Trailers have enough room for the cars, storage space for spare parts, tools and diagnostic equipment. RPM Trailer Sales Stacker Trailers are available in both Tag-a-Long and gooseneck / fifth wheel styles. Our all aluminum stacker trailers are providing the industry with leading craftsmanship and uncompromised strength for all your specialized needs. A Stacker Trailer designed by RPM Trailer Sales will allow you to safely haul multiple cars, or any of your precious cargo in an "over and under" configuration and thus avoid excessive trailer lengths. With a variety of options available, we can set your operation up with the highest quality Stacker Trailer custom built to your exact specifications. We feature custom built solid floor All-aluminum lifts, custom aluminum cabinet designs and so much more. RPM Trailer Sales has you covered with a full line of Stacker Trailers in any configuration you can dream. 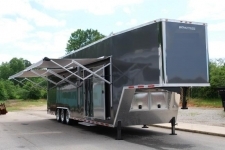 You can also check our race trailers page for additional trailer configurations. Call RPM Trailer Sales today to design and quote your custom stacker trailer.